Many advisors dread participant meetings, so do many participants. If you are starting to feel that dreadful feeling in the pit of your stomach, keep reading because you can engage and motivate plan participants like never before with TRAK’s Batch Processing solution. Now you can quickly give retirement plan participants a meaningful report illustrating their contributions and their impact on retirement and answering their most important question: “Am I ready to retire?”. TRAK-Online’s Batch Processing solution is comprised of three reports, generated after importing census data and then a few clicks of the mouse. The Batch Gap and Contribution Analysis reports are both focused on the participant. Rather than providing participants with less-than-helpful generic information or asking them to log onto the plan web portal after the meeting, these reports are advisor-driven allow the advisor to provide each participant a report with their personal information on it. Participant want to know “Am I ready to retire?”, with TRAK’s Batch Processing you can be the advisor who answers that question. Participant meetings and participant education doesn’t need to be boring and generic. With the right approach, advisors can engage plan participants, motivate them to increase deferrals and have the opportunity to discover outside assets to bring into the plan. The right approach means connecting with and engaging participants on a personal level with information that is relevant and meaningful to them and answers their most important questions. 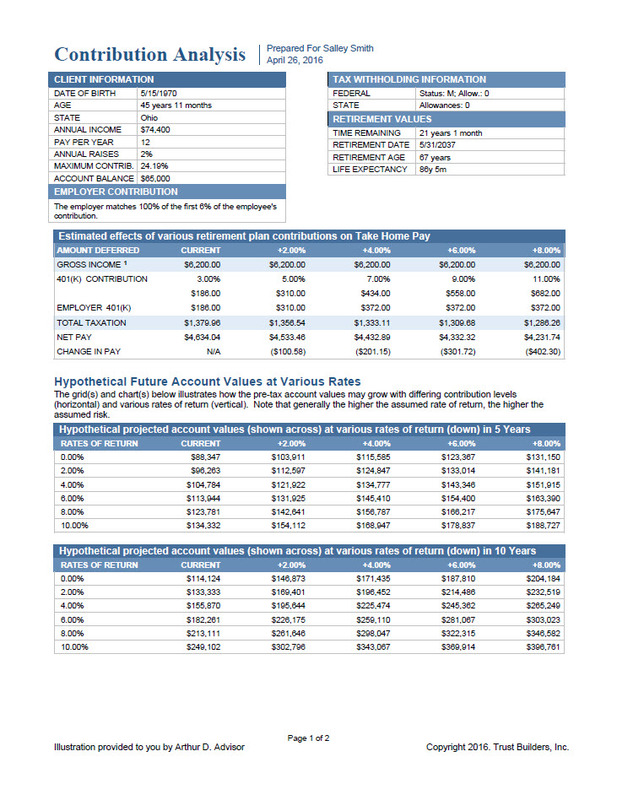 TRAK’s Batch Gap report provides a one-page gap analysis report for participants that answers the question, “Can I retire?” This easy to understand report engages participants because it uses their actual information. When participants see their current paycheck information it immediately get’s their attention. 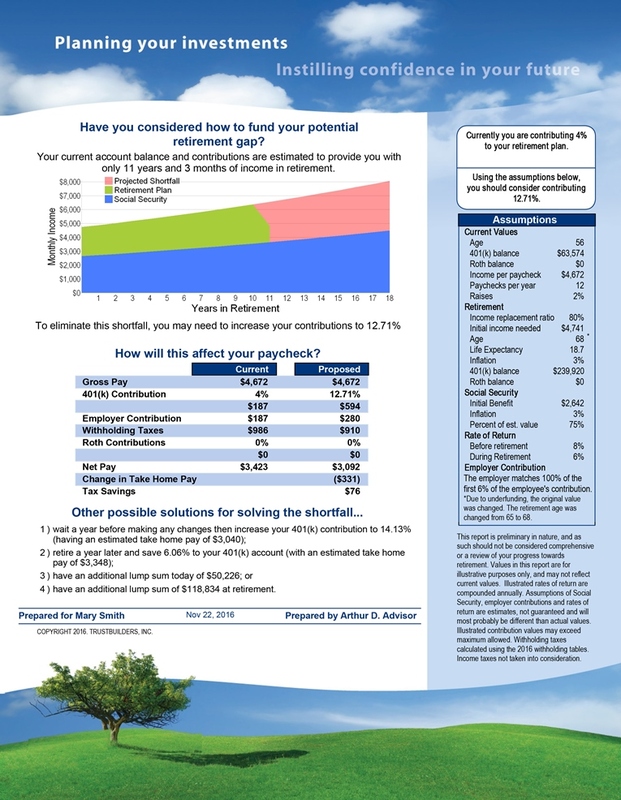 When they can see suggested shortfall solutions and how those actually affect their take-home pay, it provides meaningful education and helps participants understand the decision they have to make.to examine how well their retirement is funded—and how closing a potential shortfall will impact their take-home pay. 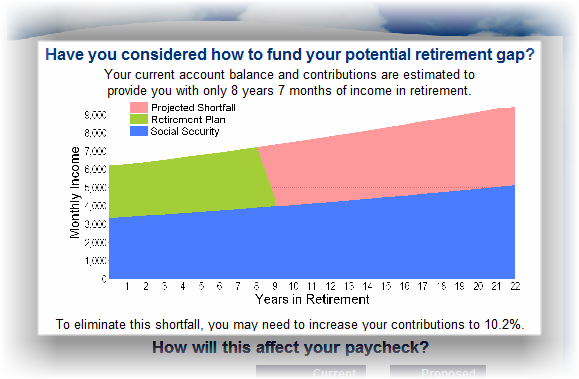 The chart at the top allows them to see their progress in funding retirement in a meaningful way. The Batch Gap report shows the client’s current paycheck and the proposed change to take-home pay (the value that means the most to the client). Additionally, the bottom of the report presents options for funding retirement, including the cost of waiting before increasing contributions, retiring a year later, or if they have additional assets outside of their retirement plan. For clients who are significantly underfunded, the calculation engine can be configured to automatically modify the scenario to reduce a shortfall. For example, it could increase the client’s retirement age until the increase in contribution falls within a specific threshold (the modified data is noted in a footnote). Similar functionality can be applied for overfunded clients. The Batch Gap report provides a meaningful, quick assessment of how well a plan participant is funded for retirement and the available options for addressing the projected gap. Using the Batch Gap and Contribution Analysis reports in combination provides an effective set of tools for helping advisors educate plan participants for retirement. Help plan participants take incremental steps to reach their retirement goals. When a participant sees that they will need to make a big jump in their contribution in order to be ready for retirement, this can be discouraging and demotivating. TRAK’s Batch Contribution Analysis report illustrates to plan participants a number of different contribution options and also how those options might be projected into retirement. This helps participants understand their options and if they can’t make a big increase in their contribution, it helps motivate them to begin taking smaller steps to move forward. TRAK’s Contribution Analysis Report starts by calculating a client’s paycheck (including tax withholdings), allowing a client to connect with the information being presented. Moving on from their current situation, the report illustrates the impact of increased contributions on the client’s paycheck. The illustrated increase in contributions can be configured as needed and can even illustrate yearly increases in deferrals such as might be present in a plan with auto-escalation. The report can illustrate how the increased contributions grow over time at various rates of return (e.g., 5 years, 10 years and at retirement). Additionally, the report can illustrate the impact on the projected retirement account balance at retirement if the client should wait before increasing the amount of his or her contributions. 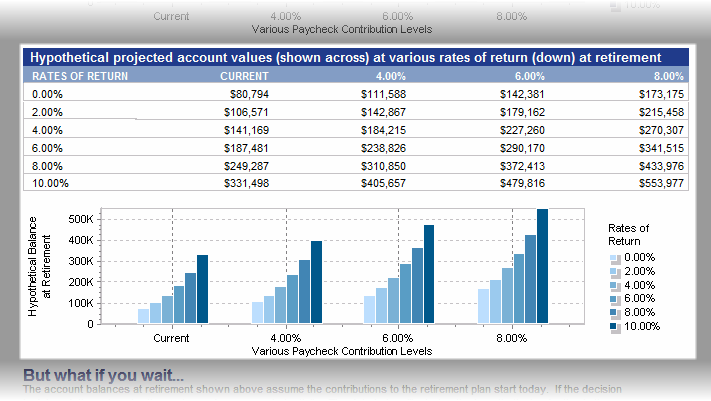 Finally, the report can illustrate the income stream from the projected account balances at retirement. Some advisors have objected to the wealth of information provided in this report. Please note that the amount of information can be reduced. However, once advisors use this report, they often respond differently. 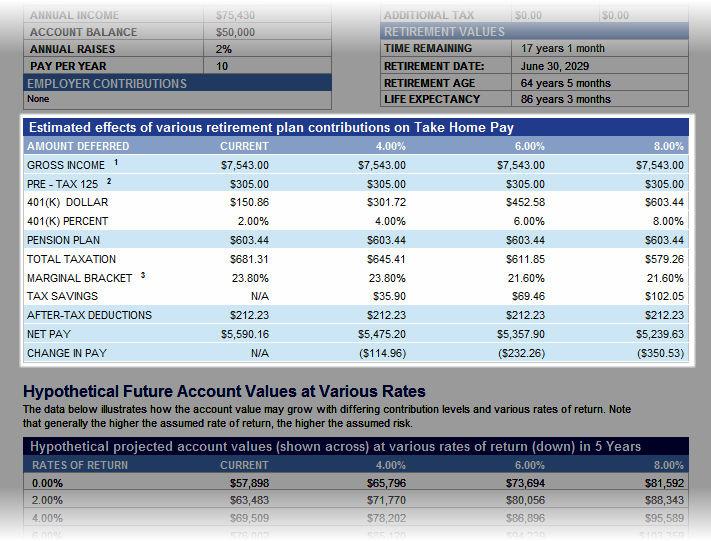 Plan participants are able to understand the report because the calculations are based on their own paycheck. This helps them connect with the data and they quickly understand the other ideas that are being communicated. The Contribution Analysis report is an excellent solution for an enrollment or re-enrollment meeting. It helps clients quickly comprehend the impacts of increasing contributions not only on their paycheck, but also in retirement. Help your participants start taking steps to a successful retirement! The growth of defined contribution plans over the last decades has been exponential. As more advisors market their servies to plan sponsors, it becomes increasingly difficult for advisors to differentiate themselves and their services from the rest of the pack. Without providing unique, value-added services to plan sponsors, advisors may find it difficult to prove that they are having an impact on plan participation. Advisors can distinguish themselves by providing the plan data plan sponsors really want to see. Advisors using TRAK-Online’s Participant Benchmark report and rise above the competition and give plan sponsors the data they want and need. The Participant Benchmark report is designed to be given to plan sponsors. Rather than focusing on plan fees and investment options, both important metrics, the Participant Benchmark report focuses on the participants themselves. How many are participating? What are the average contributions and balances? 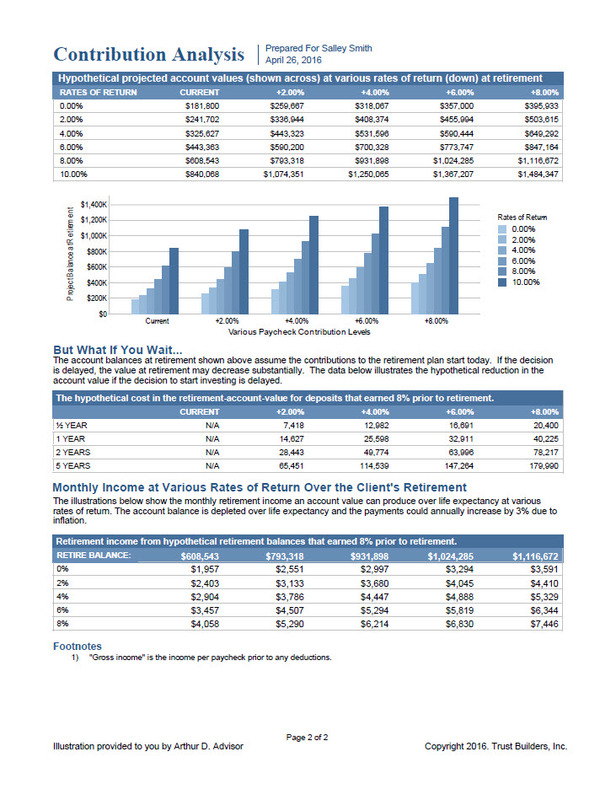 What is the projected retirement income replacement ratio? These data=sets and more can then be further segmented by age and income level. Historical data can also be incorporated into the report allowing an advisor to demonstrate to the plan sponsor how participation and contributions have grown overtime. The Participant Benchmark report includes more than 15 charts and grids that can be included, excluded, and reordered as needed. Stand out from the crowd by providing plan sponsors key participant metrics and showing how the participant retirement readiness is improving on your watch. Stand out by using TRAK’s Participant Benchmark report.